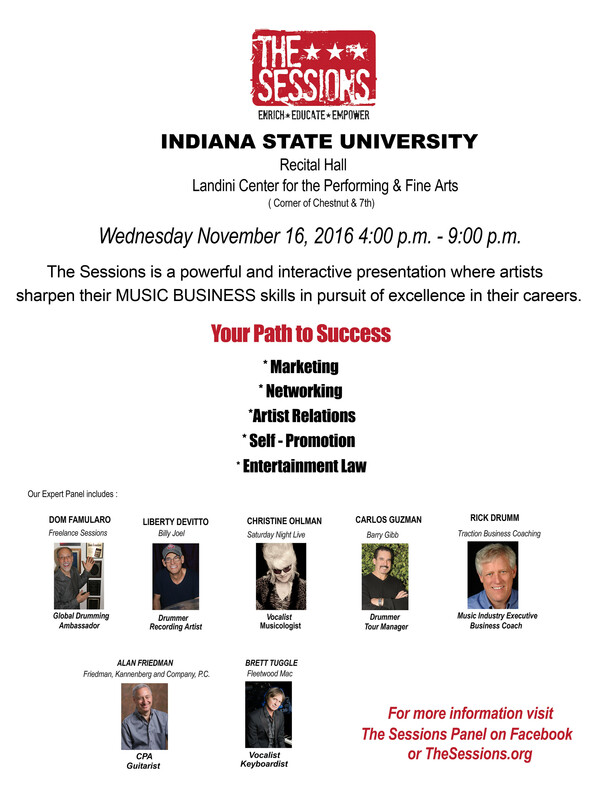 The Indiana State University School of Music will host a tremendous group of music industry professionals at 4 p.m. Wednesday, Nov. 16 in the recital hall of the Landini Center for the Performing and Fine Arts. Presented as The Sessions, they will help aspiring performers, producers, educators, music business students and anyone else interested in learning about the ins and outs of the music industry. The event is free and open to the public. The panel of nationally known industry professionals include: Liberty Devitto, drummer for Billy Joel; Christine Ohlman, longtime vocalist for Saturday Night Live Band; Carlos Guzman, tour manager for Barry Gibb's "Mythology The Tour;" Rick Drumm, founder and president of Traction Business Coaching; Alan Friedman, certified public accountant (and rock guitarist) at Friedman, Kannenberg and Company, P.C., Brett Tuggle, keyboardist for Fleetwood Mac and Dom Famularo, longtime professional drummer. The Sessions is meant to help students, aspiring producers, beat makers and any other musicians find their path to success as a business professional, regardless of their current level of expertise or experience. The event will highlight marketing, networking, life coaching, artist relations, self-promotion, entertainment law and even accounting issues for musicians, among other topics. These panelists will offer a unique insight to the music industry, including business tips and real life experiences being shared by music industry professionals with years of experience. The panelists will draw on their own backgrounds, education and experiences to give a glimpse of what it takes to succeed in today's music environment. The day's events will consist of three parts: first, the panel discussion/presentations starting at 4 p.m. A pizza dinner will be provided for free to all attendees. Finally, at 7:30 p.m., the presenters will pick up their instruments and form a once-in-a-lifetime core group where audience members are free to join in and jam (any instrument and vocalists) with these great players. It promises to be an amazing event! Seating is limited, so any students/faculty/staff or other guests planning on attending needs to register on The Sessions' website at thesessions.org to guarantee their seat. The Landini Center for the Performing and Fine Arts is located at the corner of 7th and Chestnut streets. For more information, contact Professor Ted Piechocinski, Indiana State School of Music, at ted.piechocinski@indstate.edu or 812-237-3008. A panel discussion by nationally known industry professionals starts at 4 p.m. A free pizza dinner follows for all attendees. Finally, at 7:30 p.m., the presenters will pick up their instruments and jam. Register at www.thesessions.org.